Adrian Tomine, Drawing Delicately from Life Movie-theater owner Ben Tanaka is having relationship issues; his girlfriend, Miko, suspects he's secretly attracted to white women. (She's right, but he won't admit it.) In Shortcomings, Asian-American graphic novelist Adrian Tomine (Scrapbook, Summer Blonde) has finally done what many fans and critics have suggested he should: addressed race in his work. 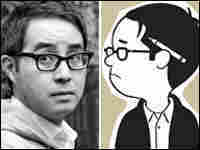 In Shortcomings, Asian-American graphic novelist Adrian Tomine (Scrapbook, Summer Blonde) has finally done what many fans and critics have suggested he should: addressed race in his work. Tomine is celebrated for the grace and sophistication of his work; novelist Jonathan Lethem says that "his mastery of literary time suggests Alice Munro," and Junot Diaz says Tomine's "dramatic instincts are second-to-none."